His Excellency Edgar Lungu, President of Zambia, and His Excellency Nana Akufo-Addo, President of Ghana, today visited the Amatheon Agri Zambia farm in Mumbwa District as a showcase of responsible investment in agriculture and to strengthen ties for further investments. President Akufo-Addo was impressed with the works he saw on the ground and urged the company to invest in Ghana too – saying the farm tour was a real eye-opener and that rural Africa can develop its regional economy through agribusiness. “Amatheon Agri is a model of agricultural development that needs to be replicated,” President Akufo-Addo said. Both Presidents spoke of social integration in the context of agricultural development, and that investments should be incorporated on a social level so the local people can also benefit from such development. The farm tour included visiting the workshops, pivots, dams, wood shaving and processing units, feedlot, as well as meeting smallholder farmers participating in Amatheon Agri’s Outgrower Programme. 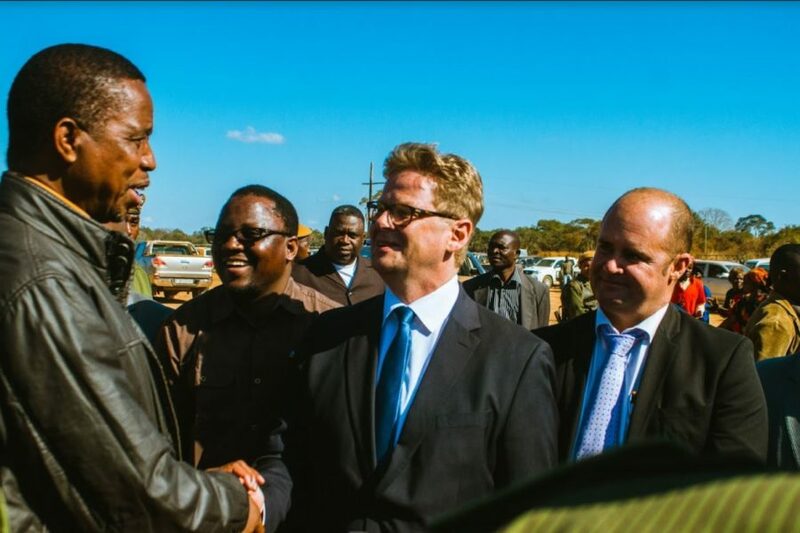 “We were delighted to host these distinguished guests and to exhibit the significant agricultural investment built over the past six years – combining large-scale commercial farming and working relationships with smallholder farmers,” said Founder and CEO of Amatheon Agri, Carl Heinrich Bruhn. Through its Presidency of the G20, Germany has introduced a ‘G20 Compact with Africa’ which aims to increase investment opportunities, push for more sustainable infrastructure as well as create jobs and employment in African countries. Ghana was one of the first countries to join the Compact, committing itself to improving conditions for private investment as part of the agreement. Since 2011, Amatheon Agri has developed two farm blocks in Mumbwa district – around 3,000 hectares for both rain-fed and irrigated cropping activities. One of these farm blocks is a Joint Venture with Toyota Tsusho Corporation – the trading arm of the Toyota Group. In addition to growing crops such as maize, soya, wheat, groundnuts and potatoes, Amatheon Agri also runs a breeding herd of cattle and a feedlot, and an Outgrower Programme currently supporting 10,000 smallholder farmers through training and market access.